SLCG Blog: Sacha Baron Cohen and Nicholas Schorsch – Masters of the House! Sacha Baron Cohen and Nicholas Schorsch – Masters of the House! On Monday, Global Net Lease, Inc. (GNL) and American Realty Capital Global Trust II (ARC Global Trust II) announce a merger. Under the agreement, ARC Global Trust II shareholders will receive 2.27 shares of GNL for each share of ARC Global Trust II common stock they own, which implies $19.59 per each share of ARC Global Trust II share based on GNL's closing price as of August 5, 2016. ARC Global Trust II's 8-K announcing the merger and merger agreement can be downloaded here. It’s a sordid tale, worthy of a Broadway musical and Sacha Baron Cohen should play Mr. Schorsch. In the musical Les Miserables, an inn keeper - Thenardier - and his wife plunder unfortunate souls who wander into their house of ill repute. Mr. Cohen is hilarious as Thenardier in the 2012 movie adaptation. You can see him in full-camp mode perform in “Master of the House” in this YouTube video (click here). Watch it and see if you don't agree Mr. Cohen would make a great Mr. Schorsch. ARC Global Trust II started raising money in August 2014 and by March 31, 2016 had raised $305.5 million in gross proceeds from the sale of 12.4 million shares of common stock, including shares issued through DRIP and shares redeemed through shares repurchase program (SRP). 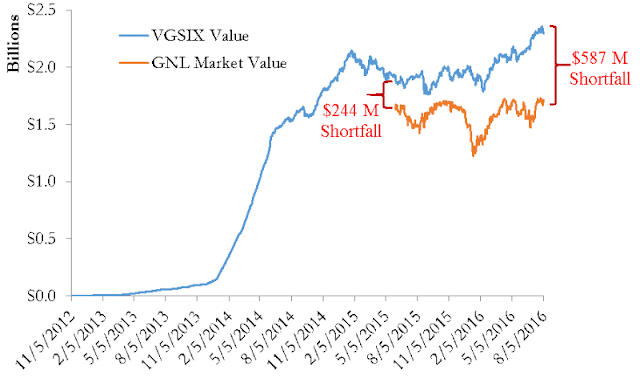 If the investors’ cash flows into the common shares had been invested in the Vanguard REIT Index Fund, the investors would owned VGSIX shares worth approximately $334 million as of August 5, 2016. Instead, they own ARC Global Trust II shares are worth $237.0 million based on the proposed merger. Investors suffered a shortfall of about $97 million as a result of being sold ARC Global Trust II. On June 2, 2015, non-traded REIT American Realty Capital Global Trust Inc. - rechristened Global Net Lease, Inc. - began trading on the NYSE under the ticker GNL. ARC Global Trust was the 42nd non-traded REIT to have listed, or merged into or been acquired by another REIT since 1997 and added to the mounting wealth toll non-traded REITs have extracted from unsophisticated investors. The non-traded REIT industry had by the end of 2015 transferred at least $45.5 billion in wealth from investors to sponsors and the lowest tier of brokerage firms. The first 41 non-traded REITs had cost investors $25.5 billion in lost wealth and 40 additional non-traded REITs which had not yet updated their NAVs had cost investors another $20 billion in lost wealth. ARC Global Trust raised $1.78 billion between October 1, 2012 and March 31, 2015 – most of it in the first six months of 2014. As of March 31, 2015 there were 179.6 million shares outstanding so investors paid, on average, $9.91 per share for ARC Global Trust shares. At the close of the first day of trading June 2, 2015, GNL shares were worth $9.32, giving investors a total value of $1.674 billion. Including the $114.7 million in distributions ARC Global Trust had paid by March 31, 2015, investors received approximately $1.79 billion from their $1.78 billion investment. This is a gain of only $10 million, or 0.56%, over three years. 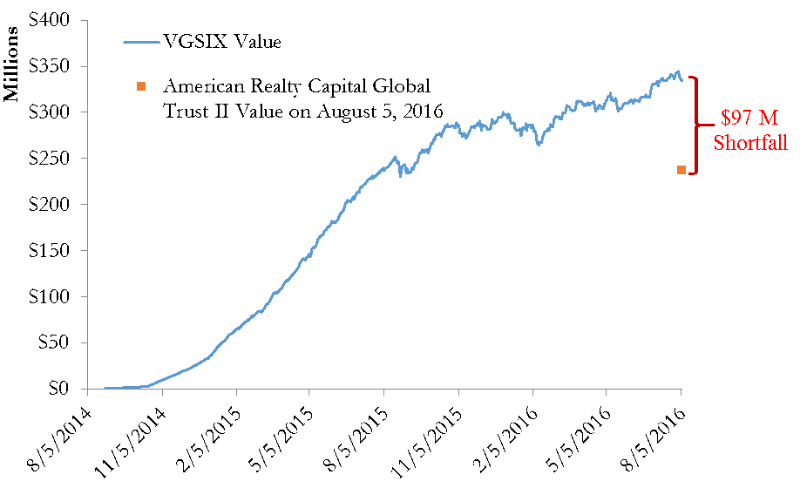 If instead of being sold ARC Global Trust, investors had put their average purchase price of $9.91 into Vanguard’s REIT Index fund (VGSIX) in the first six months of 2014 and took out the same amounts as ARC Global Trust distributed, the VGSIX investment would have between worth $1.918 billion at June 2, 2015’s closing price. 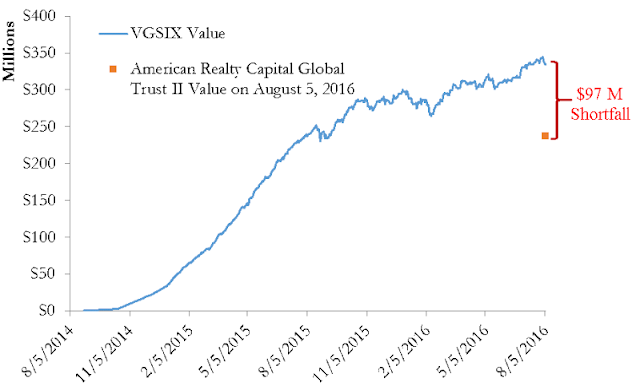 Investors in ARC Global Trust were thus $244 million worse off on June 2, 2015 than they would have been if they had been recommended liquid, diversified, low-cost REITs instead of the illiquid, undiversified, high-cost ARC Global Trust. Figure 1 presents the value disparity graphically. "The harm investors suffer from this newly listed REIT is unlikely to end Tuesday. Yesterday after three days of trading, GNL closed at $9.06. Investors who didn’t sell on June 2 lost $47 million over the next two days and now have lost on average $37 million as a result of investing in this non-traded REIT. Concurrent with the NYSE listing, GNL entered into a new long-term contract with its Advisor (controlled by American Realty Capital executives). The new contract increases the Advisor’s conflicts of interest, and makes it harder for the REIT to fire the Advisor. GNL’s move to strengthen its ties with its affiliated Advisor is contrary to most non-traded REITs. Normally, non-traded REITs internalize the advisory function at the time of a listing, thus severing relations with the Sponsor and slashing inflated expenses which had been paid to entities controlled by the Sponsor." Our full June 5, 2015 blog post on ARC Global Trust / GNL can be downloaded here. 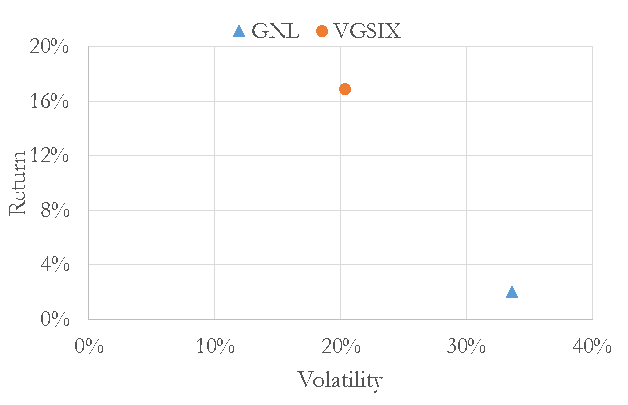 In the 14 months since ARC Global Trust listed as GNL, GNL’s annualized total return was just 2%, while investors in Vanguard’s diversified REIT fund had a 16.9% annualized return. 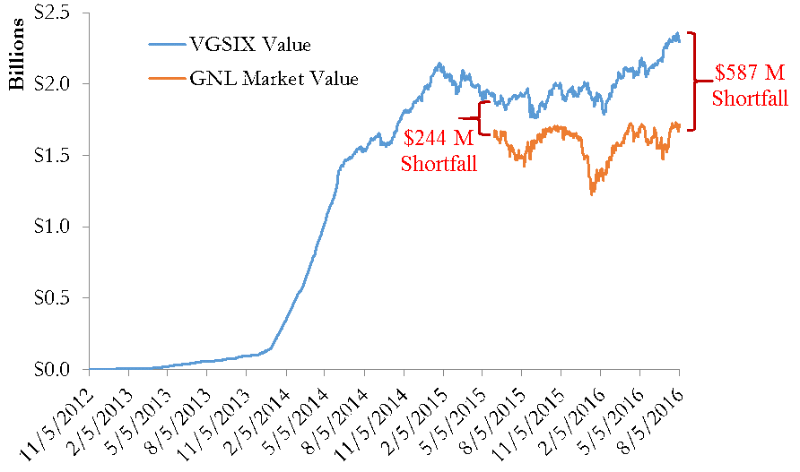 GNL not only earned much lower returns it was much more volatile than VGSIX. 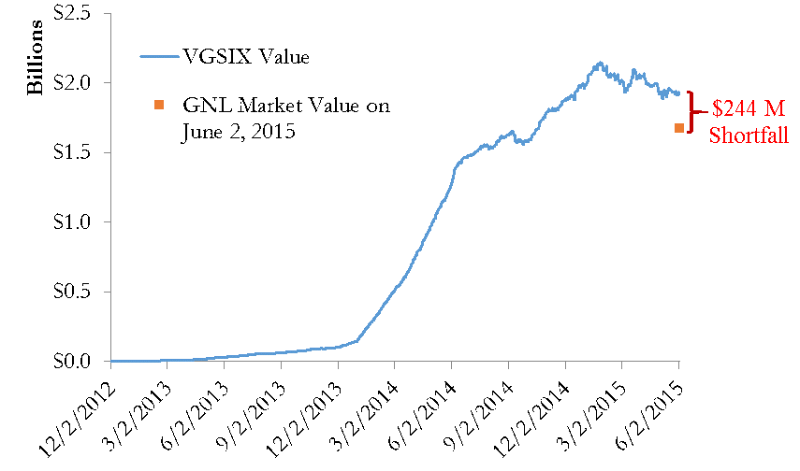 GNL’s annualized standard deviation was 33.6% compared to VGSIX’s 20.4%. See Table 1 and Figure 3. The $684 million in investor harm caused by Mr. Schorsch is roughly half as a result of the large upfront commissions paid to third tier brokerage firms that specialize in selling high-commission, illiquid investments to unsophisticated investors. The rest of the shortfall is the result of the high advisory fees the REITs controlled by Mr. Schorsch pay Mr. Schorsch. ARC Global Trust entered into a 20-year advisory agreement with Mr. Schorsch that would shock the conscience of anybody but a Thenardier before listing as GNL. With the proposed merger, this advisory agreement now covers ARC Global Trust II as well. We’ll write more about this advisory agreement and about ARC Global Trust II and GNL’s recent efforts to ensure dissenting shareholders don’t receive the appraisal rights to which they are entitled next week.